There are lots of things to do around Cee Vee. Check out the recurring activities and special events on calendar below. If you know of others, please let me know. Also check out the websites of the Texas Plains Trail and the Panhandle Tourism Marketing Council. They have a lot of events and activities that they constantly update. There is also miles and miles of beautiful drives. One of most impressive drives in the state is Texas 207 south toward Silverton. For miles agricultural riches spread from horizon to horizon; then the highway plunges into scenic grandeur at Palo Duro Canyon. Descend at a moderate speed, both for safety and to absorb beauty that unfolds in a riot of colors. In the nine-mile-wide canyon (which extends a hundred miles from northwest to southeast) is the Prairie Dog Town Fork of the Red River, a seemingly insignificant stream to have carved such an immense gash in the Plains. Farther south the highway drops into another beautiful gorge, Tule Canyon. More varieties of rock strata are visible, and some magnificent sheer-faced, knife-edged buttes. A country and western music every weekend at Hotel Turkey, in Turkey, TX. The Turkey Jamboree at the Gem Theatre located at 217 Main Street, Turkey, is the home of a monthly Jamboree held the first Saturday of each month beginning at 7:00 pm in downtown Turkey. Admission to the Jamboree is free. Dinner is served in the patio area starting at 6:00 pm, and is sponsored by area organizations. For information contact the Turkey Heritage Foundation, Marie Cruse, PO Box 131, Turkey, TX 79261, (806) 423-1420. The Armstrong County Museum in Claude has a number of events. See armstrongcountymuseum.org for more information. The Rimstone Revue is a musical variety show on the 1st Saturday of each month at 7:30 pm. February through December, 2011, the Community Theatre will produce four shows and five Texas Commission on the Arts Touring Artists will be scheduled. Jodie and Larry Daniels join the Gem family to produce eight shows on the third Saturday night of each month, beginning in March and continuing through October. Meet the Longhorns every Saturday. The staff at Cooper Breaks State Park (Crowell) call the longhorns up to the fence; two will eat out of your hand and one will offer you a big, wet, sloppy kiss. You don't have to kiss him, but he will make the offer. The park has 11 steers from the official state herd. Accessible for the mobility impaired. Comanche Springs Astronomy Campus, located between Crowell and Paducah, Texas, will again host public Star Parties beginning about March 2009. Known as the largest privately supported astronomy campus in the Southwest, Comanche Springs provides several unique opportunities for the public to view the universe through numerous world-class telescopes and other distinctive astronomy gear at the campus 12 miles west of Crowell. The opening activities are held on the Campus StarField with as many as a dozen telescopes ready for viewing. Attendees are then encouraged to roam between the telescopes and view the various sights made available throughout the evening. Each monthly event is attended by a host of 3RF Volunteers from many area Astronomy clubs (including Dallas, Lubbock, Amarillo, Fort Worth, Wichita Falls, to name a few) who explain the highlights of the night as well as assist with actual use of the telescopes by campus visitors. The 40’ tall Big Dome houses the largest privately owned refractor telescope in Texas that is available to the public and the unusual “roll-off” observatory actually rolls back its roof so that additional telescopes can be set up for the public. The most popular instruments are the 15”- 18’ refractor telescope and the Australian battery-powered Star Chair. Scheduled star parties begin about an hour before sunset with solar viewing and the night’s program beginning at dark. Picnic areas are provided and, unless overnight camping is requested, registration is unnecessary. It is advised to watch the 3RF website or call the 3RF office for the recorded message if weather is inclement on the date of the Star party. The 3 Rivers Foundation uses such events in accordance with its mission to increase science awareness to students and the general public. If you would like additional information about programs @ Comanche Springs Astronomy Campus, contact: www.3rf.org or call 940-684-1670. Rodeos There is a rodeo somewhere nearby all summer long. These are usually ranch rodeos where the contestants are not professionals, but cowboys who work on the local ranches. They are a lot of fun. Sometimes a neighbor will be participating as was Brandt Seal in this picture from the rodeo in Groom in 2009. Below, the cowboys are milking a wild cow. The have to rope the cow, run her down, get the rope off, and then get milk in a bottle -- fastest time wins! Wellington Fourth of July Rodeo -- Fourth of July Rodeo takes place at the Wellington Fairgrounds on South Hwy 83 in Wellington. For more information call the city office at 806-447-2544. Clarendon Annual Saints’ Roost Celebration -- Each July 4 the community of Clarendon experiences the annual Saints’ Roost Celebration and Rodeo. For more information go to www.clarendonedc.org. Tulia Tule Blue Creek Bluegrass Festival -- The Tule Creek Bluegrass Festival occurs over the weekend after 4th of July at Tule Creek Park in Tulia, TX. The family festival features a number of stage shows. Panhandle Bluegrass & Old-Tyme Music Association sponsors this yearly event. Childress Old Settlers Association Rodeo and Celebration Friday and Saturday the third weekend in July. The Rodeo starts at 7:30 with a kids rodeo and the big folks kicking off about 8. The Parade is on Saturday morning, July 17 at 10 am. They usually have a cattle penning competition about noon on Saturday. There is a dance both Friday and Saturday evening. Contact Josh Hassell 937-2349 or Sondra Hatcher 937-3440. Crowell will hold a ranch rodeo in July. The Caprock Roundup and Old Settlers Reunion is held the second weekend in July, this event features a parade, free barbecue, crowning of Miss Armstrong County Queen, little Miss and little Mister Armstrong County. Vendors set up on the square during the event and a theatrical performances are held in the Gem Theatre. Visitors may visit the Armstrong County Museum and Art Gallery, admission free. The ranch rodeo, sponsored by the American Legion, is held at the Bert Wooldridge Arena in the evening and the dance follows at Legion Hall dance pavilion. All this in the heart of Charles Goodnight Country, Claude, Armstrong County, Texas. For information see www.armstrongcountymuseum.org or call 806-226-2187. Quartz Mountain Music Festival is held annually in Granite, OK north of Altus in July. Join them for an intimate evening with world-renowned Los Romeros. During this evening, enjoy the opportunity to hear the Romero Guitar Quartet bring you a truly intimate experience of the rhapsodic Spanish repertoire. For tickets and more information, go to www.qmmf.org or call the Altus Chamber of Commerce at 580-482-0210. 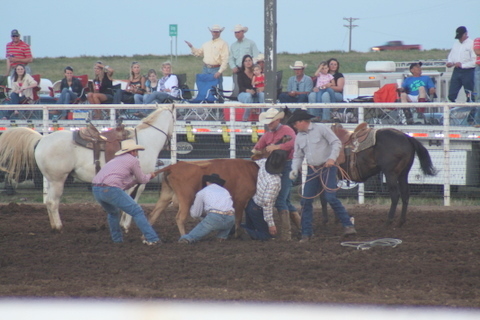 Dalhart XIT Rodeo and Reunion -- The XIT Rodeo and Reunion takes place the first Thursday, Friday and Saturday of each August. The event originated when ranch hands from the XIT decided to get together to swap stories and rodeo. Now, the three-day festival features a watermelon feed, pork chops from Premium Standard Farms, and each night the Professional Rodeo Cowboys Association is center stage with spectacular competition. On Saturday afternoon the world’s largest free barbeque feeds 20,000 people the best, most tender brisket you have ever tasted with the traditional fixins’ of beans, bread, pickles and slaw. Saturday morning brings a large street parade followed by the growing Fiddler’s Contest at Veteran’s Memorial Park. The contest draws competing fiddlers from several states. XIT Rodeo, going strong for more than 70 years, there is fun for adults and kids alike. Each evening’s dance features some of country music’s most famed entertainers. And the LaRita Theater presents an annual melodrama. So take a step back in time and enjoy the show, which is always sold out! Visit www.dalhart.org or call (806) 244-5646 for information. In August, is the annual Quanah Rodeo at the Quanah Roundup Club Arena. Call the Quanah Chamber of Commerce at (940) 663-2222 for more information. Buck Wild Days Rodeo in Silverton August. 118th annual rodeo is an official Professional Rodeo Cowboys Association sanctioned event. A great rodeo bull, Up In The Air, will be one of the animals cowboys try to ride at this rodeo. Last Blast of the Summer in Vernon is in August. They will have a series of antique car and tractor shows on each day with other entertainment including music. The car and tractor shows are held at various banks in Vernon. The final awads are on August 15. The best rodeo in the world is the Original Texas Ranch Roundup which began in 1981 and is held annually every August in Wichita Falls. To be eligible to participate in the TRR, a ranch must be selected by the Roundup Committee with consideration given to working ranch status, length of ownership or management and historical significance. Contestants and alternates must be full time employees of their ranches, and they must have been employed a minimum of six months. They ride their own horse or one belonging to the ranch. What makes the Texas Ranch Roundup unique is that it incorporates the entire ranch family with a cookin' contest as well as a festival including photography, painting & drawing, furniture, crafts and western handiwork. Winners of these events earn points that, combined with their points in the rodeo, make up the Ranch Roundup winner. Bit, Spur & Western Collectibles Show- Friday & Saturday, 9am-7pm. Admission, Over 200 Booths. The National Cowboy Symposium and Celebration will be held in September at the Lubbock Memorial Center in Lubbock, Texas, home of Buddy Holly and the National Ranching Heritage Center. This event celebrates the culture of the American cowboy. Events include cowboy poetry and story telling, chuck-wagon cook off, western merchandise and exhibits, horse demonstration, and other events. For more information, see www.cowboy.org or call 806-798-7825. Wellington Peanut Festival and Parade -- The second weekend in September is the annual Collingsworth County Peanut Festival and Parade. Call 806-447-5848 for more information. Tri-State Fair & Rodeo in Amarillo in. Kids will love this fair. They’ll meet a Bengal tiger, watch shows featuring lumberjacks and pirates, be mesmerized by a hypnotist, go wild on the carnival midway and throw themselves into the pig races. Don’t miss the cooking contests, live popular entertainment, livestock judging, rodeo and parade. Rodeo last three evenings of fair. Tri-State Fairgrounds, 3301 E. 10th Ave.; 806-376-7767; www.tristatefair.com. South Plains Fair in late Sept Lubbock. This fair features a children’s petting barnyard and a carnival midway. Livestock judging and exhibits of creative arts, crops, agri-science and agricultural mechanics round out the fun. Panhandle-South Plains Fairgrounds, 105 E. Broadway (next to Mackenzie Park); 806-763-2833; www.southplainsfair.com. Annual Childress Christmas Festival is held in November from 5 to 7:30 pm in Fair Park. Numbers are handed out and then you get to search for your number in merchants windows. Santa arrives on the fire truck to the delight of all the little ones. Other events held will be hay rides through the park, cake walk and hot chocolate. For more info call 937-2567.